Accepting orders for, Limited Edition, "Steel Icons", replica of historic bridge in. Easy assembly with sections snap fitting together and secure with rivets. Model will provide good level of detail, review photos for detail, and is a great starting point for modeler to add high level of detail. Model for display or incorporation into your diorama or layout. Is two (2) track replica of a Deck truss bridge. Model is based on the AT&SF/BNSF Canyon Diablo Bridge near Flagstaff, AZ. Bridge is Key to high capacity corridor overcoming this natural barrier. Common to designs of the era. Nothing beats a bridge as a focal point of interest on your railroad!! Model is compressed and works for HO & S Scale. Model is approximately Four Feet. 48, in length accommodating most modelers space requirements, while capturing the character and mass of a Deck truss design. Model is based on the BNSF Canyon Diablo Bridge in AZ. Key to high capacity corridor overcoming this natural barrier. Bridge, Length: Four Feet = 48" Center between foundation piers is 26". These bridges, often taken for granted, large rivers and have played a major role providing a seamless rail transportation network in the United States. Today, after many decades of service, they are an important part of our transportation network. I have offered a line of architectural models, including bridges, viaducts, tunnel portals, retaining walls and structures found along the right of way since 1989' I originally started out building models replicating subjects I could not find in the market place. Goal is to offer several "Steel"models, intermediate to large designs, with good level of detail, a metal structure with sufficient size and detail, not exact, but close, capturing the character & mass of the prototype. Designs geared for the serious modeler. Model would be a significant point of interest for display or incorporated into your your home or club layout or diorama. Help me to access level of interest in producing this product. Model will be offered in. 2 Completely assembled, ready for dispaly or incorporation into your club, home layout or diorama. This is a special quote reflecting extra charge for those who do not wish to assemble themselves. Possibly in Fabricated sections, like the old model car kits, enabling you to build a custom design. I will offer associated bridges and abutments that lead up to the primary bridge as seperate add ons. Model Suitable for O gauge. Working up a price structure that will be affordable for the serious modeler or architecture fan. 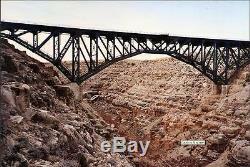 The item "BNSF Canyon Diablo Deck Bridge KIT Make an offer @ $300.00. O Gauge IN STOCK" is in sale since Wednesday, May 11, 2016. This item is in the category "Toys & Hobbies\Model Railroads & Trains\O Scale\Parts & Accessories\Buildings, Tunnels & Bridges". The seller is "trains04nw" and is located in Kathleen, Georgia. This item can be shipped worldwide.